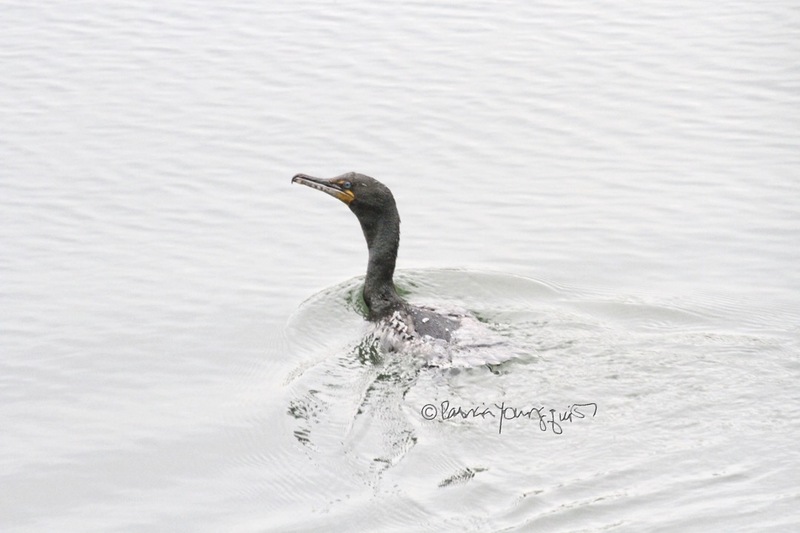 In my Wednesdays' Wisdom segment here on Blogger for 1/9/2019 (which was two weeks ago), I discussed some facts re the bird type known as Cormorants, the avian creature featured in the photo atop this entry where he/she is swimming in the Jacqueline Kennedy Onassis Reservoir within Central Park. 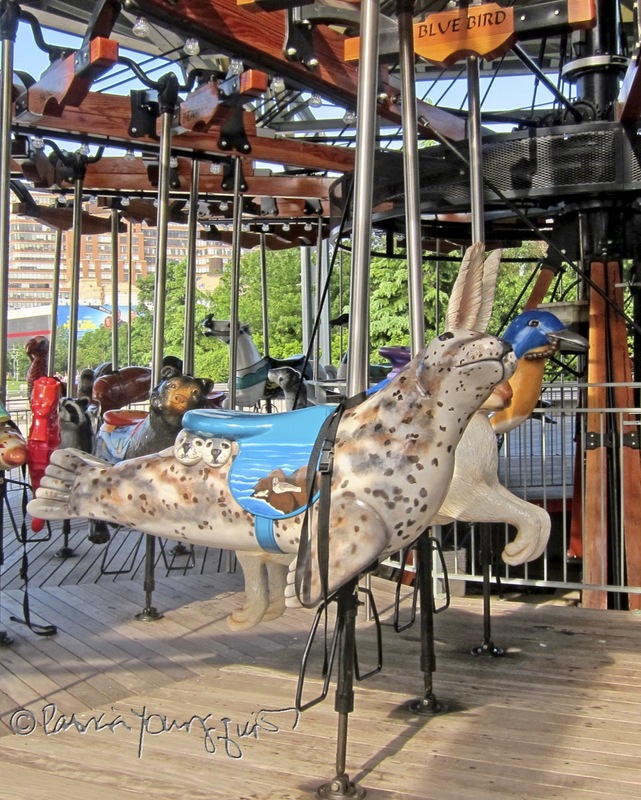 One of the matters the story re Cormorants featured there discusses, which is an aside to facts re this bird, is explains this bird type type is part of a carousel NYC in which the animals a person rides upon is made up of animals rendered in the likeness of creatures who frequent the Hudson Valley which includes cormorants. 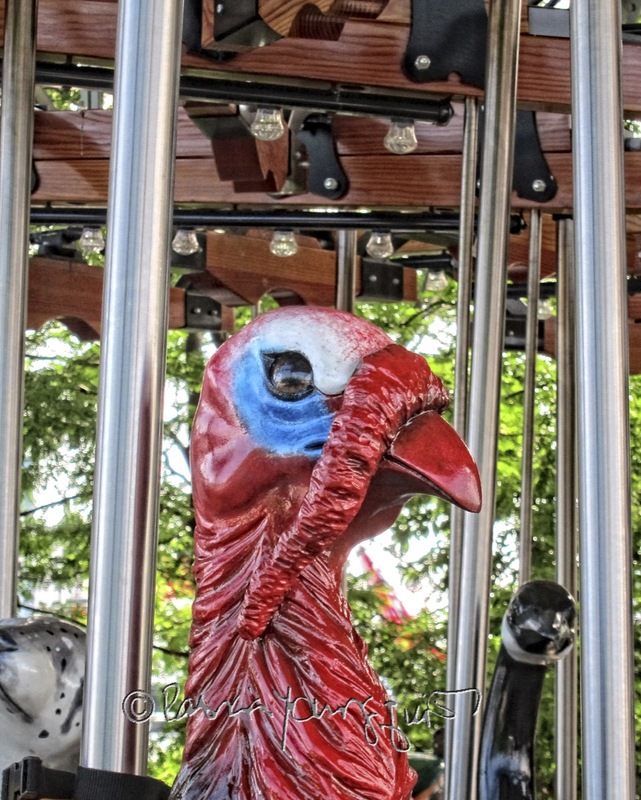 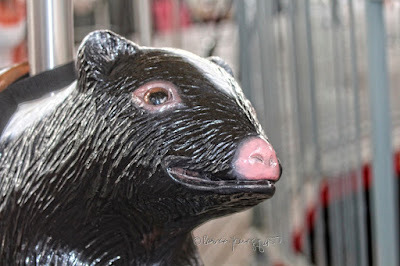 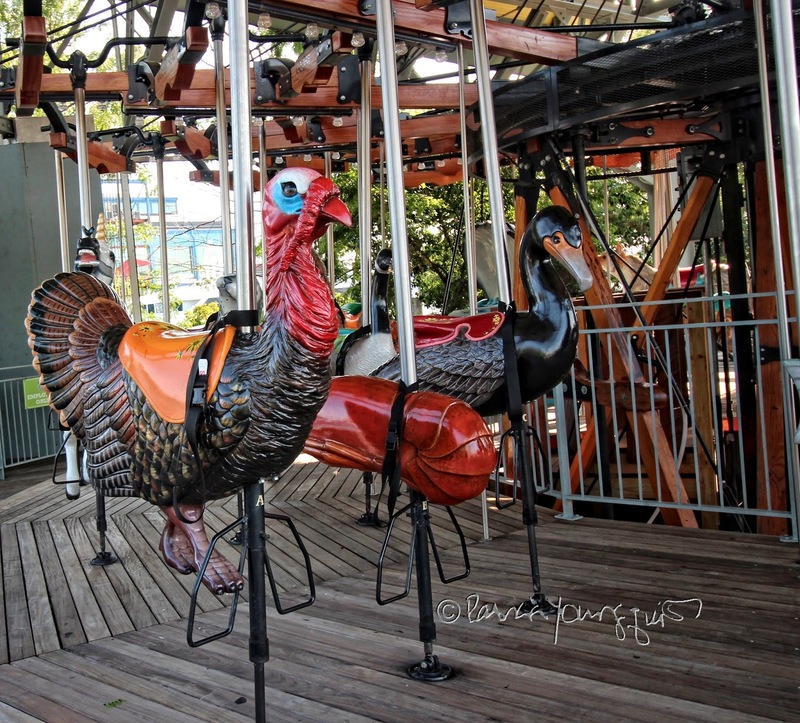 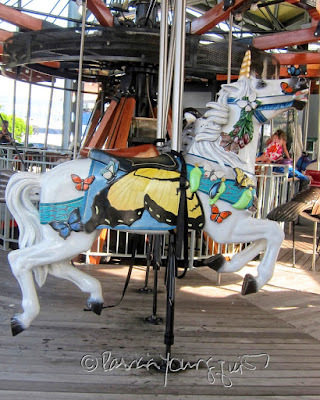 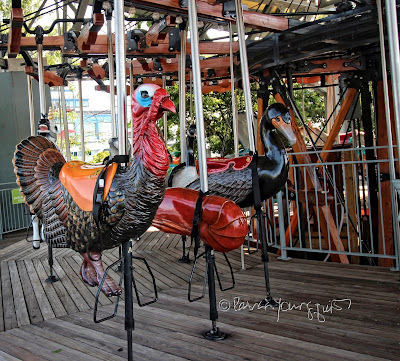 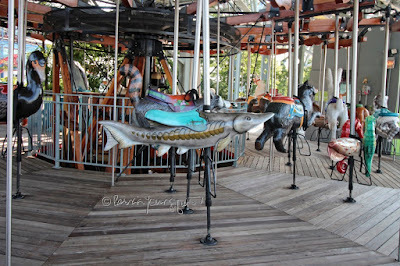 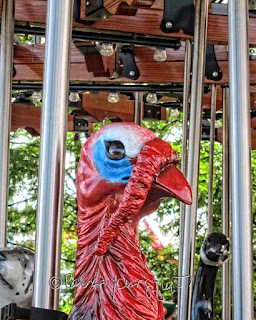 ... and am using today's segment of my Tuesday's Truths series as an opportunity to tell you a little bit more about it as well as other carousels and to give you a few fun facts re merry-go-rounds (the common name for this fun ride). 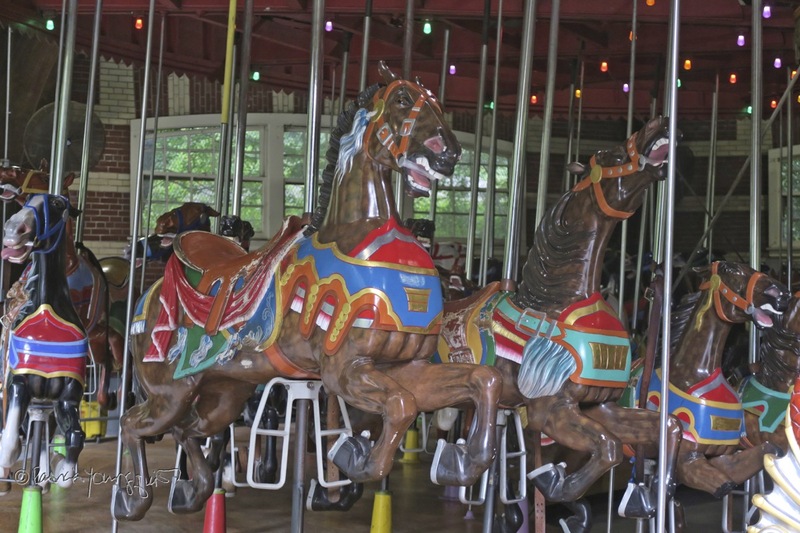 Like all all (or at least most) carousels this one runs in a counter-clock wise mode, this is something runners evidently do. 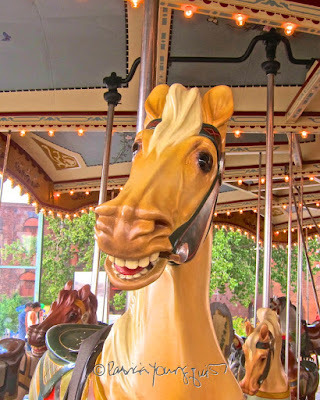 I've read that "clockwise running tires people" and "as the heart is on the left side, for humans and animals, running anti clockwise makes the centrifugal force in the body to act from left to right. 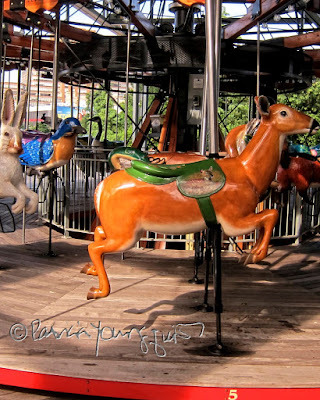 ... that is why, in olden days, health officers ensured that all carnival merry-go-rounds were run only in the anti-clockwise direction." 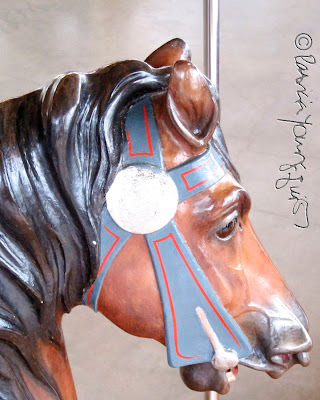 More info re the hows and whys runners run counter clockwise can be found by clicking here. 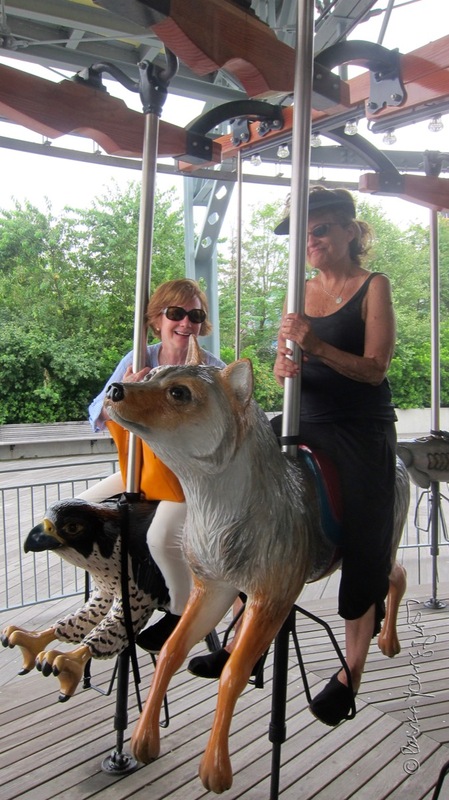 But getting back to the Hudson Valley animal themed carousel, the picture directly below taken nearly five years ago feature yours truly (on the right) enjoying this merry-go-round). 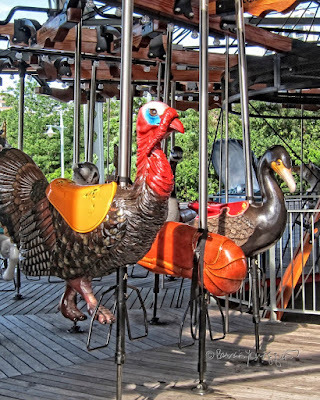 .... while the next three feature details of the wild turkey. 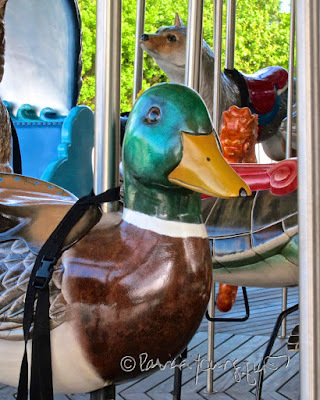 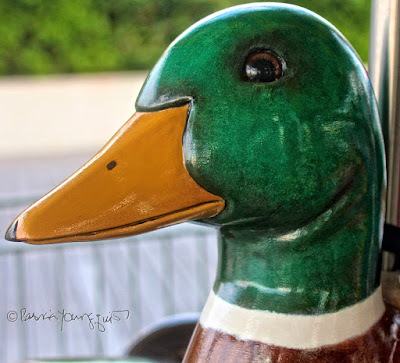 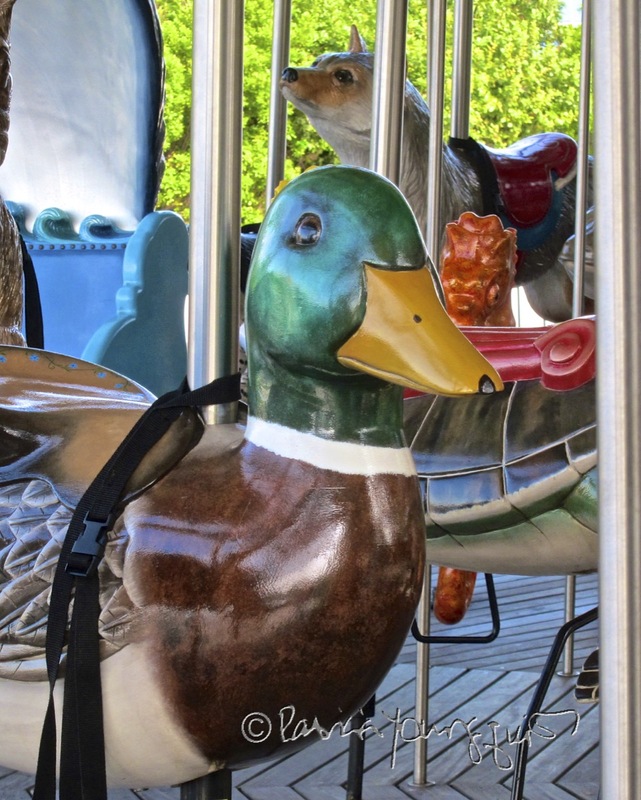 The Cormorant and the the wild turkey are not the only birds to be found on this carousel there are a few more including an Eastern Bluebird and a male Mallard duck, seen below (respectively). Eastern Bluebirds were adopted as the state bird of New York n 1970 and, evidently, they frequent Central Park. 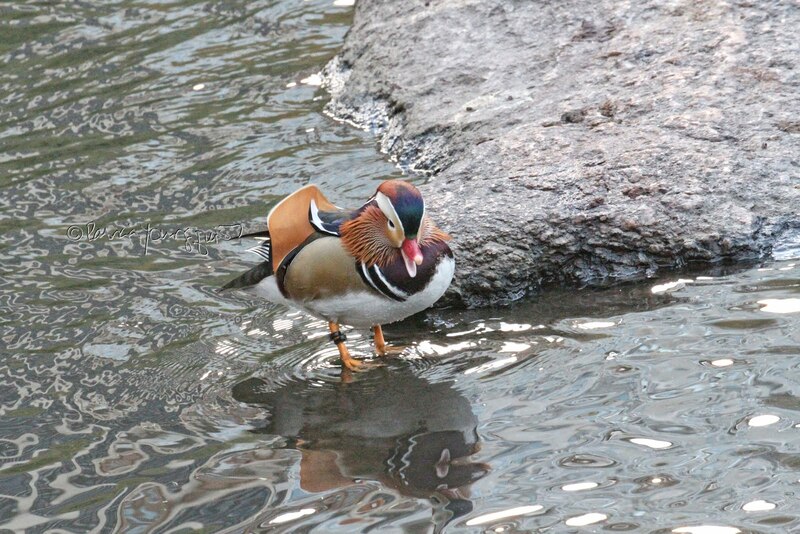 Mallard ducks also frequent Central Park (as well as Riverside Park) and I've been blessed to witness their antics, which I've discussed in a number of entries her on Blogger. 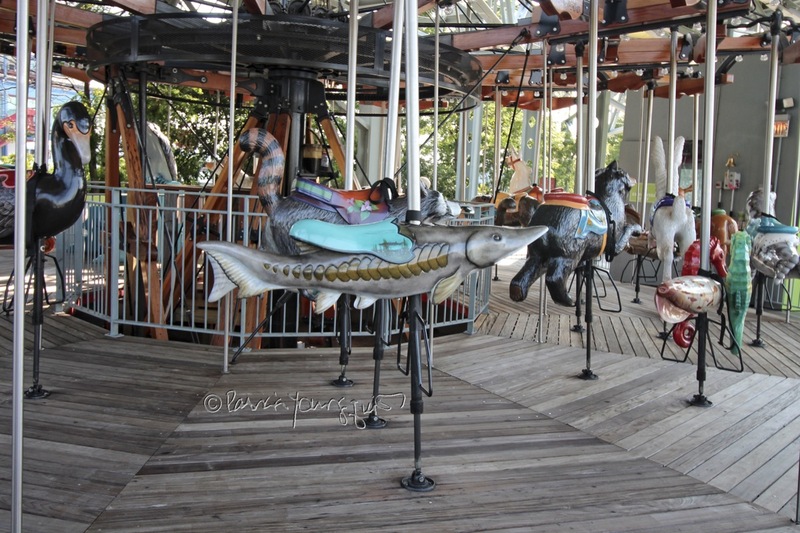 However, the carousel that I've been describing does not just include the birds of the Hudson Valley, it features several other animals. The following set of photos features a few of them in full view as well as in close-up views of some of their details. 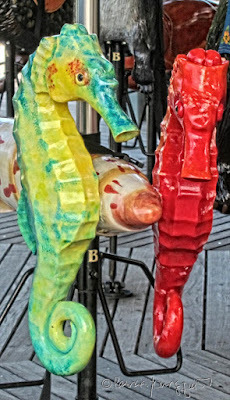 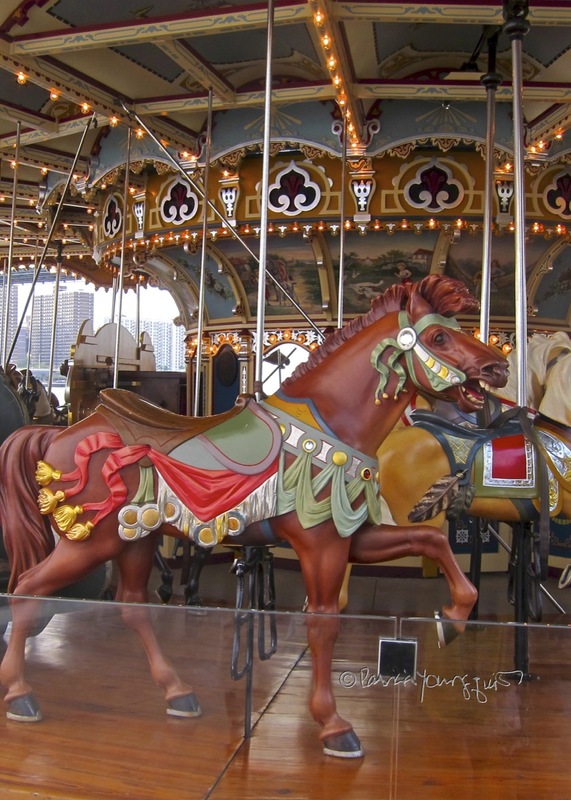 The Hudson Animal carousel is not the only merry-go-round in Manhattan there are others including one at Bryant Park as well as one in Central Park. The latter can be seen in the picture directly below. 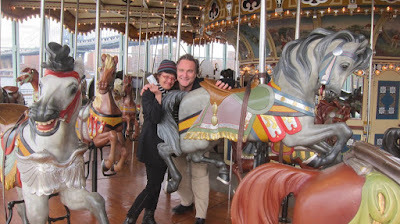 There are also carousels in Brooklyn. 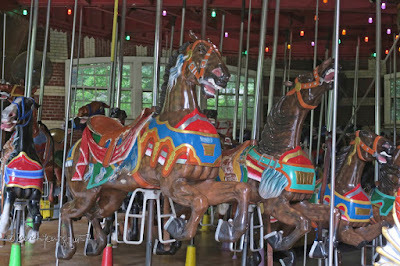 The one in Prospect Park I've only seen when tandem cycling, but the other known as Jane's Carousel is in Brooklyn Bridge Park. 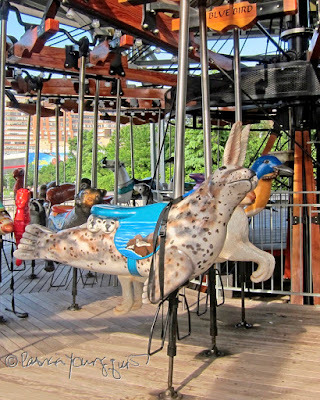 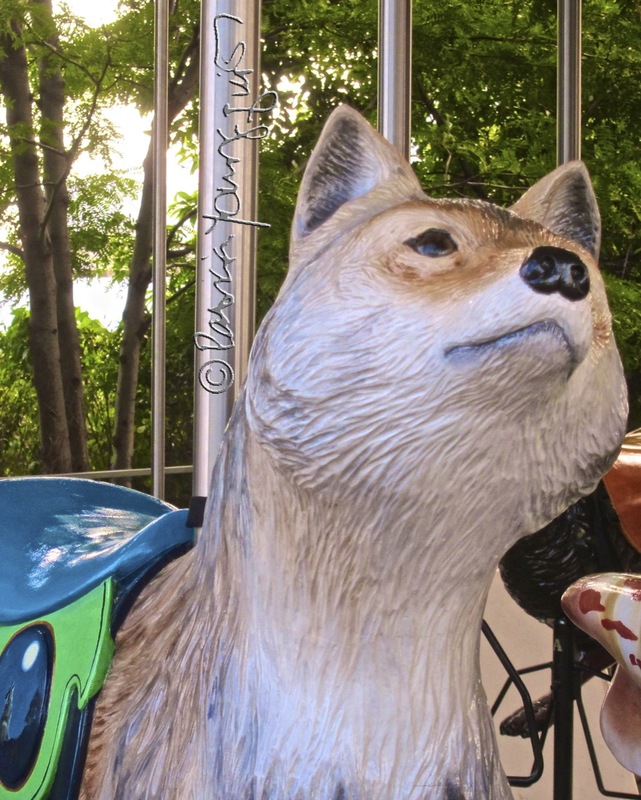 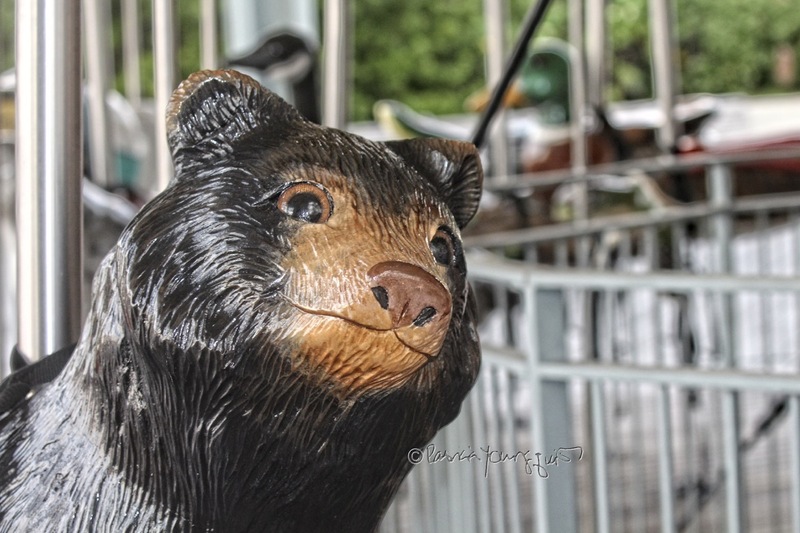 According to Wikipedia, "Jane's Carousel (formerly Idora Park Merry-Go-Round) is a carved, wooden, 48-horse carousel that was built in 1922 for the Idora Park amusement park in Youngstown, Ohio by the Philadelphia Toboggan Company... 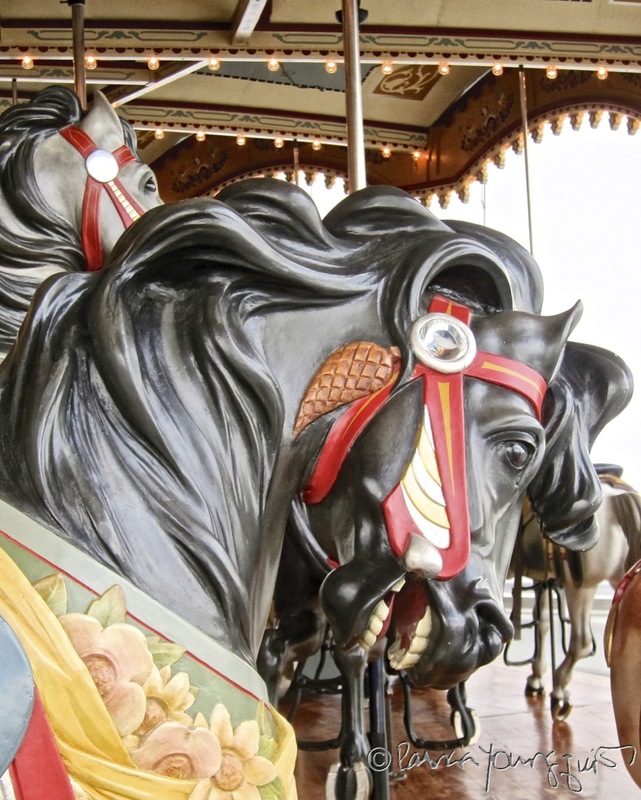 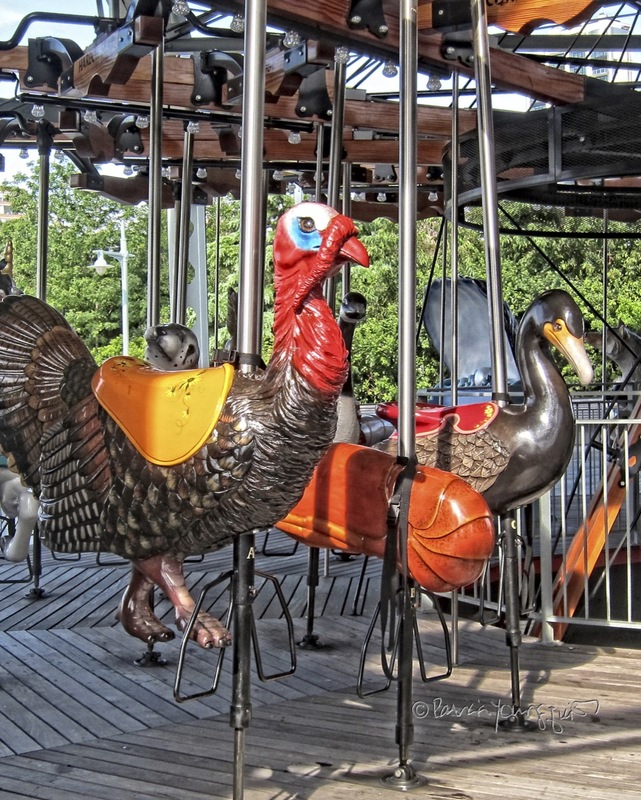 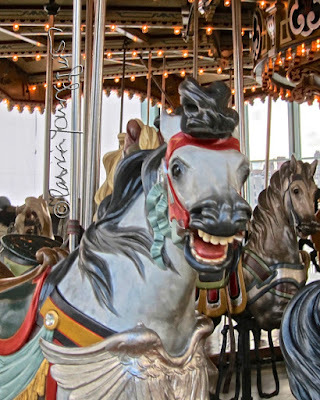 When Idora Park closed to the public in 1984, the carousel was bought at auction by Jane and David Walentas and moved to Brooklyn, New York, for restoration." 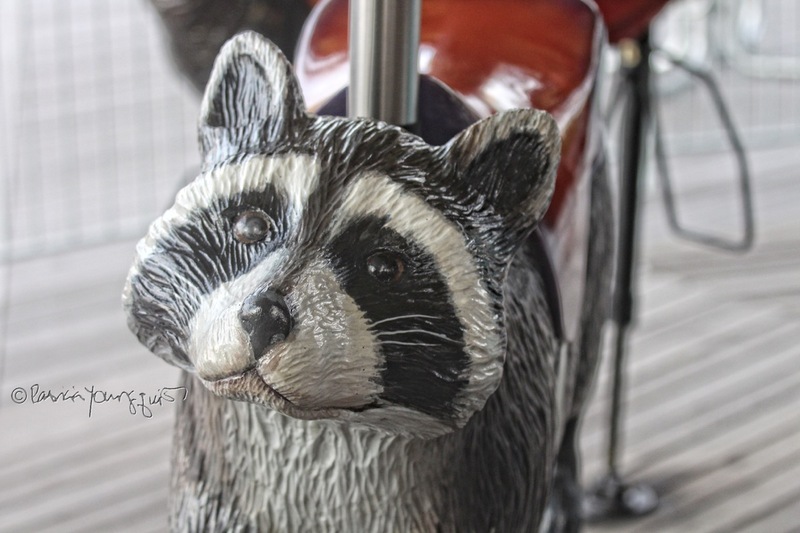 The following pictures featuring certain details from this carousel. 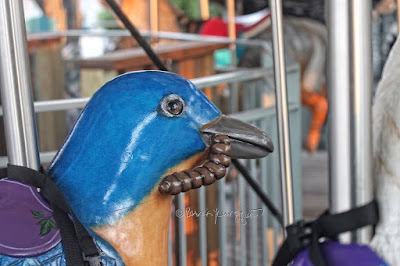 I went to Jane's back in 2013 with MM (who is someone that helped me during the first major upheaval (garden renovation) in my rooftop garden) and he can be seen with me at Jane's in the next two photos. 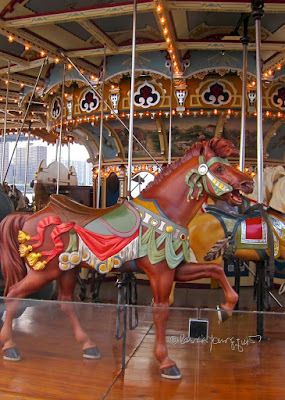 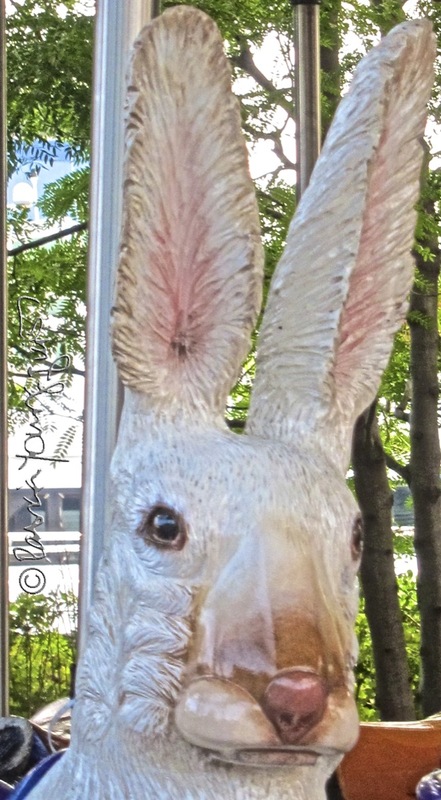 Btw, MM's wife grew up in Youngstown Ohio where (as Wiki states) the animals from Jane's Carousel originated. 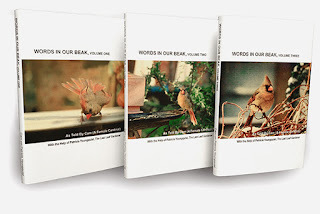 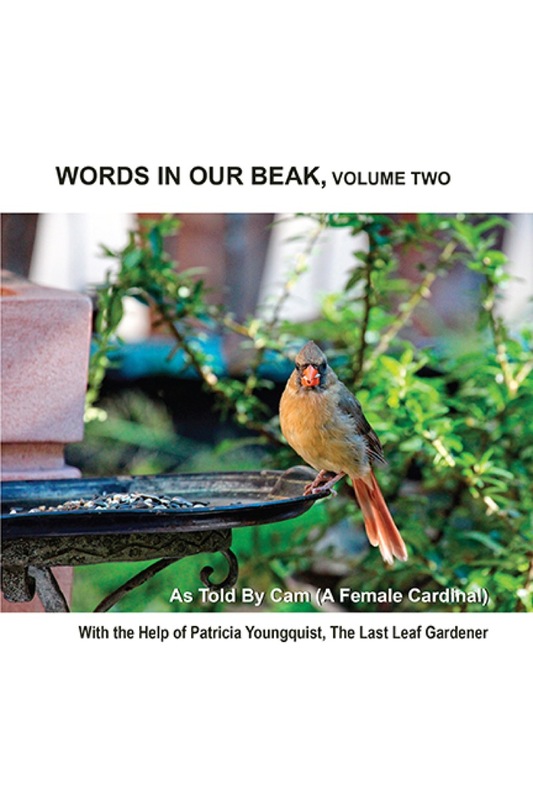 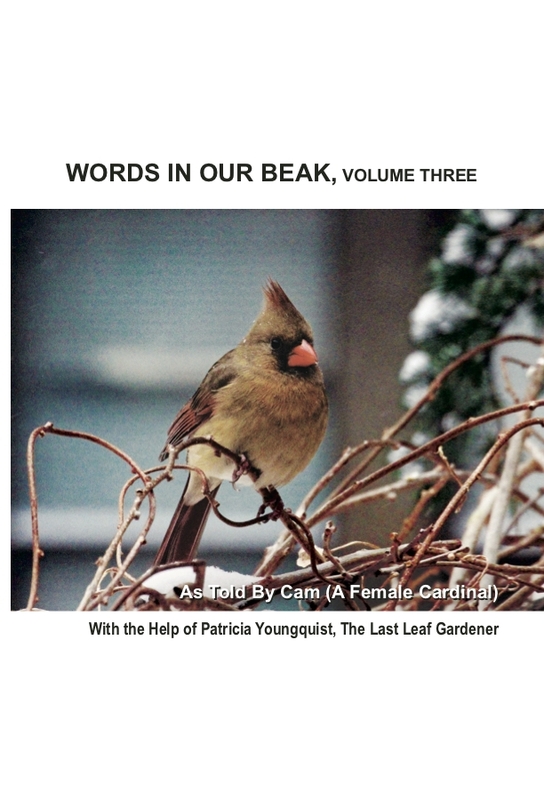 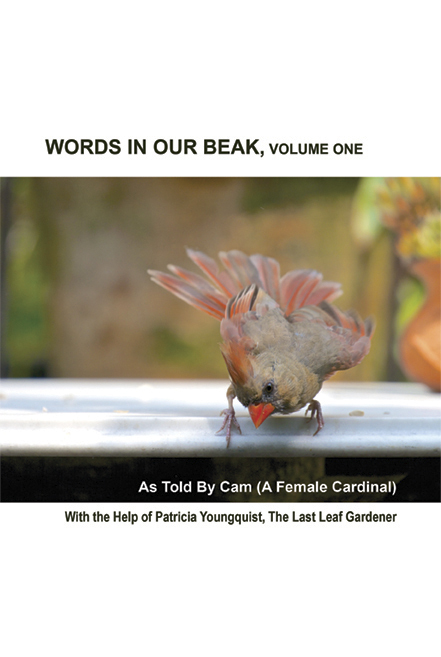 Moreover, the work MM and I did during my first garden upheaval is discussed in volume two of Words In Our Beak. 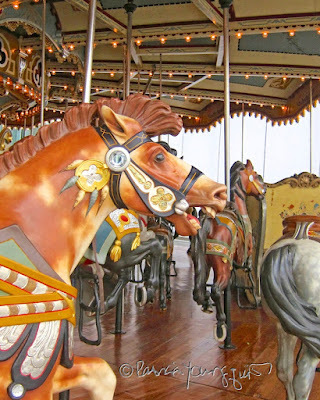 And with this, I'll leave with these thoughts for the day re carousels but also with a song ("The Circle Game" sung by Joni Mitchell) referencing merry-go-rounds.